OYEZ! oyez, oyez! Warwick School pupils received an annual news announcement in true historical style. 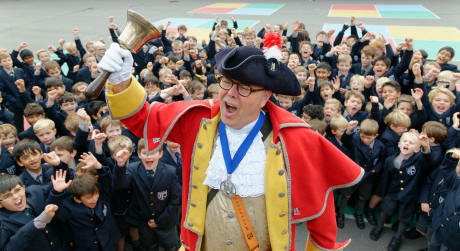 Warwick Town Crier Michael Reddy requested the headmaster grant permission for an extra week’s holiday at half-term for the boys. The granting of which was greeted with a big cheer from the gathered pupils. The traditional invitation to the town crier is one that dates back to at least 1912. Mr Reddy also collected £350 donated by pupils to the mayor’s charity, which this year was Molly Olly’s Wishes, a local charity which works to support children with terminal or life threatening illnesses and their families to help with their emotional well-being.